Orthodontics and Dentofacial Orthopedics is a dental specialty that deals with correction of malocclusion (bad bite) and straightening of malposed (crooked) teeth. A doctor who is a specialist in this field of dentistry is called an Orthodontist and Specialist in Dentofacial Orthopedics, also more commonly called just orthodontist. To become an orthodontist, the doctor must first become a dentist by completing four years of dental school. After dental school, the dentist then applies for admission to very rigorous and demanding orthodontic residency. Only the very brightest and most qualified dentist get accepted into orthodontic residency to get training for an additional 3 more years beyond dental school to become certified orthodontist. As you decide on where to go for your treatment, do insist on getting orthodontic care from an orthodontist NOT a dentist because there is a vast difference in education and qualification between the two. Only an orthodontist is certified and qualified to get you that perfect smile and occlusion (bite) for long term oral and masticatory health. There are many dentists who will advertise that they do braces, but never inform the public that they are NOT orthodontists and therefore have NEVER received additional years of orthodontic training from a dental school in the United States. In fact there are several dentists within a few miles of our office, who blatantly advertise that they do braces but do NOT disclose to the public that they are NOT orthodontists. Make sure you ask about the qualification and credential of the dentist if he or she did any orthodontic residency in a US dental school. Any orthodontic training oversea in a foreign country is not the same and does not qualify you to be an orthodontist in California. Choose a US trained orthodontist NOT a dentist to do your braces to get the best and proper treatment. Dr. Eric Eng, DDS, who works at our office Anaheim Dental and Orthodontics, is an orthodontist and has completed 3 years of orthodontic residency training beyond dental school to learn the proper technique to straighten teeth and correct malocclusion (bad bite). Dr. Eng has treated thousands of successful cases with traditional braces as well as Invisalign and ClearCorrect aligners. Check out the before and after results by clicking on Before/After Photos of Orthodontic Cases in the menu above. Further more Dr. Eng sees orthodontic patients every single day the office is opened, which means more than 20 days a month as compared with most other offices where the orthodontist is only there once per month. So why waste your time and inconvenient yourself by going elsewhere for braces where you can only be seen one time per month because the orthodontist is only there one time per month. When you get braces with us, Dr. Eng is available 5 days a week so more than 20 days per month for patients to get in to be seen, a convenience for patients that is surpassed by no one. For more info on the difference between an orthodontist and a dentist visit the American Association of Orthodontists website at www.aaoinfo.org. 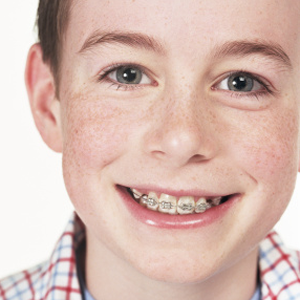 The majority of orthodontic patients are between the ages of 11 and 17. During this period, all primary (baby) teeth should have already exfoliated (fallen out). Throughout this time frame of adolescent development, the jaw goes through rapid growth spurt and it is advantageous to start treatment during this time because the orthodontist can utilize the patient’s jaw growth to maximize the best possible results. Treatment also progresses faster at this time of a child’s life. After the age of 17, jaw growth is minimal and treatment cannot benefit from jaw growth anymore. Occasionally treatment is started early in a child’s development, around the age of 7 to 9 years old. Treatment at this stage is called Phase I or Interceptive Treatment. The aim of treatment is limited at this stage usually to address the most pressing issue. Typically treatment is initiated to resolve a pressing dental concern that if left untreated will worsen and be that much more difficult to correct later and sometimes can even become uncorrectable. A few examples of dental problems that will benefit from early phase I treatment include narrow constricted maxilla/palate (upper jaw), premature loss of primary tooth, insufficient space (space loss), impacted tooth, missing tooth, extra tooth, cross bite, under bite and many more. It used to be that only kids get braces. Not anymore. We live in an ever increasing image conscious world, and adults who have missed out on the benefits of braces from their childhood are now getting them as adults. Today’s orthodontic brackets, bands, and other appliances that orthodontist use are so very small and comfortable that they are very attractive to adults now. Also there are clear tooth-color ceramic brackets as well for those who demand the nearly invisible look from braces. And if the case is very minor, there is clear aligner treatment (Invisalign and ClearCorrect) which offers the best esthetics. For more info on braces, please visit www.aaoinfo.org.